The structure of hair is a very important and complex study , which requires even further research,so that we can come up with more accurate and inexpensive treatments for any hair problem. In this article we will discuss the about the basic structure of scalp, hair and the keratin bonds one by one. These glands secrete natural oil called Sebum. The normal flow of sebum / oil helps to keep the hair in good condition. These muscles are connected to our nervous system. They are responsible for the hair to stand while in case of fear or cold. These glands plays an important role of controlling body temperature by secreting sweat. Evaporation takes away the heat when the temperature is high. These are like thin white threads which form a complete network in the skin like a spider web.The fibers provide suppleness and elasticity to the skin. The cells send and receive signals from the brain. They play a very important role of supplying required nutrition through blood circulation. It is the alive part of the hair where the hair is born. 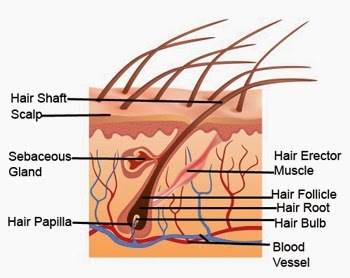 It is the outer most transparent layer of hair, which is responsible for protecting the surface of the hair. it looks like fish scales, overlapping each other. 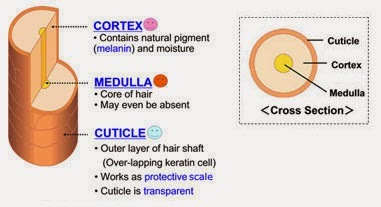 The second and most important inner layer is Cortex, which constitutes 75% of the hair.The color of hair, moisture content and overall health of a hair shaft depends highly on it. 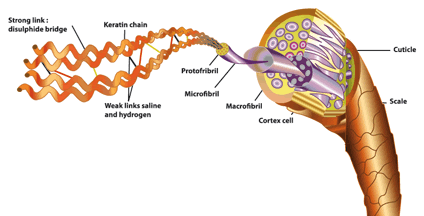 The Keratin protein Chains present in hair is the main backbone for each hair shaft. It is the inner most layer of the hair, and plays very insignificant role. Medulla is sometimes even absent in hair , usually thick hair contain it. The keratin is a sulphur-rich protein consists of long peptide chains, which forms the strong hair filaments. The composition of the disulphie chains determines the structure of individual hair filament. keratin is not only elastic but also insoluble in water.It is able to tolerate extreme temperatures both high and low, because of that, we can go for hair styling like perming, straightening ,hot curlers , hair Dryers etc. The 'disulphide’ bonds present in keratin is mainly responsible for holding the protein strands together.This bond plays an important role in any chemical processing of hair like perming and straightening. Actually these chemical break this disulphide bonds and again reset them into a different configuration to change the shape of your hair. In order to provide greater strength and glow to dry damaged hair, people are now opting for keratin treatment,where the broken and damaged bonds are repaired and your hair is healed form inside, to face the environmental stress again.